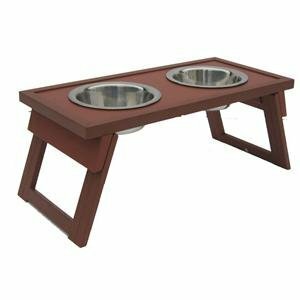 The Excellent Quality Dog Bowl Double Raised Med Rus - Habitat 'n Home HiLo Diner adjusts to 2 different heights so dogs of different stature but eating the same amount have the food at the right level. Eating from a raised diner is much better for your pet. Top is water resistant in case of spills and for easy cleaning. No assembly required. 2 removable, stainless steel bowls each holding 24 ounces. Medium size, New, Russet color.